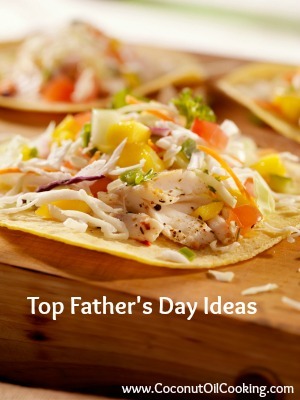 With Father’s Day right around the corner, I thought it would be a great idea to share some creative ideas that can be done at home for DIY gifts and some delicious recipes. For those you wanting to take a more all-natural route with gifts and a healthier way to cook, these tips are perfect! In the recipes and DIY projects, I’ll be using coconut oil as my main ingredient. When using coconut oil in cooking in baking, you’ll reap the benefits of the medium chain triglycerides that are found in this healthy fat, along with added flavor. With any recipe, you simply replace butter or oil for coconut oil in a 1:1 ratio. You’ll see that for my DIY projects, coconut oil has a different use for each one – you could say it is jack of all trades. Grilling – Why not try a cookout for Father’s Day? Our Summer Grilling Tips will help educate you with all you need to know for grilling proteins, vegetables and even desert! Whether adding coconut oil to your favorite marinade or topping off your grilled veggies, this healthy alternative will pack on the flavor. Beard Softener – Coconut oil by itself is great for softening any type of beard. Give dad a jar of coconut oil with cute written instructions on how to try this new technique. Simply massage coconut oil into the beard, dab off any access, and enjoy the soft benefits! Aftershave – Coconut oil, shea butter and essential oils make a soothing combination for this DIY aftershave lotion. Once made, you can put this aftershave into a mason jar for storage. Keep in refrigerator to add a refreshing coolness when your dad uses it after shaving. Desserts – We can’t go wrong with baking dad a fluffy cake or batch of cookies for Father’s Day. In any recipe that you’re making, try replacing butter or oil for coconut oil. I promise you, your cookies and cakes will come out moist and full of flavor! My lemon cake with cream cheese frosting is a great recipe to try for this summer weather. Top off with berries of your choice for added decoration. 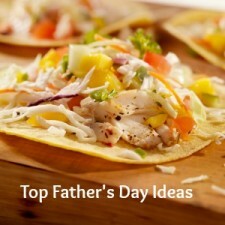 I hope that some of these tips and recipes may help you out in your quest for making Father’s Day absolutely perfect. For a lite lunch idea, try our fish tacos with mango slaw or get outside to enjoy these activities that are great for kids and dads. Happy planning! I will surely try ‘Beard Softener’, good ideas to make some people truly happy. I am really observing why coconut is a super food! A blast of thanks for you, writer. Thank you for this! We definitely LOVE using coconut oil for everything!